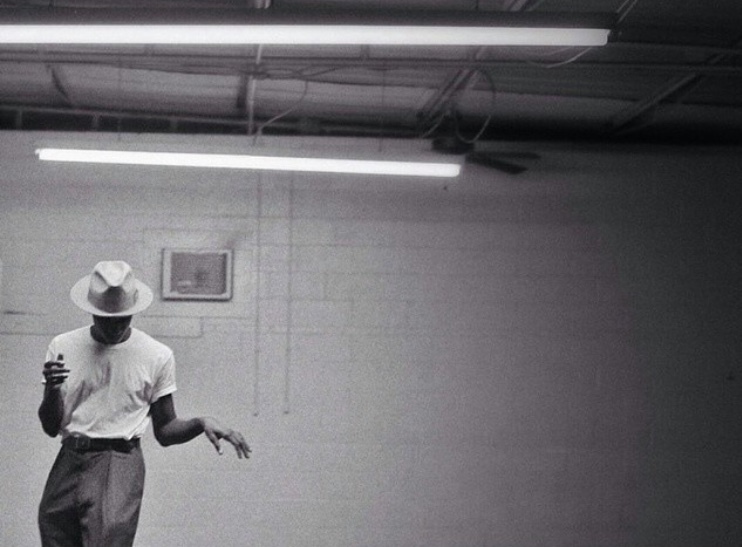 This Week, Leon Bridges Was Back In Mix. 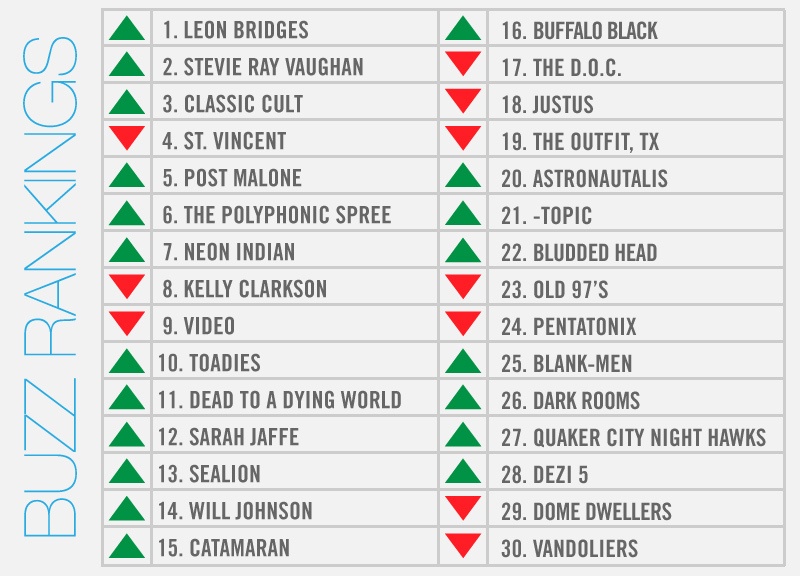 Hard as it is to believe, Leon Bridges somehow managed to skate through August without once finding himself atop our weekly local music power rankings. It was the first month of 2015 thus far in which the Fort Worth soul crooner hasn't topped our Buzz Rankings at least once. Alas, his eight-week drought ends this week as a new, free, Bridges mixtape dropped. That release not only showed off a more hip-hop friendly side of Bridges, but it also earned him his 11th No. 1 in the last 12 months. As all-time No. 1 counts Across our three-and-a-half years of doing this, Bridges now moves into sole possession of second place, still one behind Sarah Jaffe's 12, but one ahead of Erykah Badu's 10. Just behind Leon is the ghost of Stevie Ray Vaughan, who finds himself buzzing anew thanks the recent 25th anniversary of the Oak Cliff bluesman's passing, compounded by the fact that the Kessler will hold a fundraiser this weekend to help raise funds to erect a statue in his honor. And just a tick farther back, upstart act Classic Cult lands in the No. 3 hole after it was determined that the band's only live performance to date lived up to the massive hype it accumulated beforehand. Other notables from this week's list include Will Johnson and the Toadies, which each premiered tracks from their upcoming albums in national publications this week, and Dead to a Dying World, which landed a favorable review in Pitchfork. 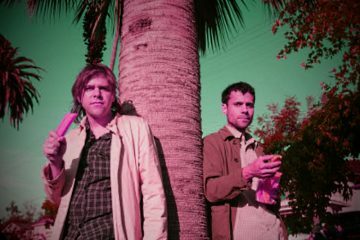 Likewise, Blank-Men and Dome Dwellers released some new tunes this week, too. 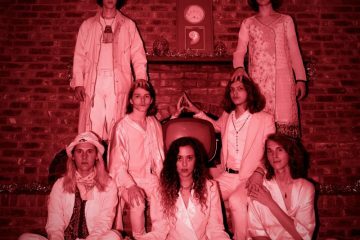 Elsewhere: Post Malone said the N-word a long time ago; Kelly Clarkson and Pentatonix played Gexa; The Polyphonic Spree announced its annual holiday extravaganza; and Sarah Jaffe, Catamaran and Doug Burr played last weekend's Summer Cut festival.